Last week a spokesperson for the Ministry of Foreign Affairs announced that Belarus was not ready to implement an agreement on local border traffic with Poland. The reason given was ‘the anti-Belarusian position of the Polish government'. Although both sides have already signed the agreement and the parliaments ratified it in 2010, Minsk is clearly not in a hurry to implement it despite the clear potential benefits to its citizens. Lithuania has a similar story to tell. In 2011 both the Lithuanian and Belarusian parliaments ratified an agreement, but it was destined to share the same fate as the Polish initiative. Perhaps Vilnius has more realistic chances of concluding such an agreement with Belarus than Poland does. Latvia was the first and the only country to manage to implement a local border traffic agreement with Belarus, in 2012. Last week's announcement by the Belarusian Foreign Ministry could be another attempt to divide EU neighbours over Belarus. The regime may be worried that local border traffic with any EU country will open the door to the West for Belarusians. The goal of the agreement is to facilitate the cross-border movement of people who live in an area up to about 30 km from the border. Instead of visas, a special document would prove the right to cross the border on a much more relaxed and cheaper basis. The Polish initiative on local border traffic with Belarus dates back to 2008. Two years later both the Polish and Belarusian parliaments ratified the agreement. In 2010 the heads of each state, Alexander Lukashenka and Bronislaw Komorowski, signed the document. Warsaw has officially declared its readiness to implement it. However, the agreement seems to have remained in a stack on Lukashenka's desk. An exchange of diplomatic notes between Warsaw and Minsk remains the final missing stage. The recent message by the Ministry of Foreign Affairs makes clear to thousands of those living on both sides of the border that Minsk has no political will to deal with the issue in the near future. Last October, Andrej Savynych sent a similar message regarding the future of local border traffic with Poland to the one received last week. "The politics of the Polish establishment in bilateral relations with Belarus creates a highly unfavourable climate" – he said, explaining the reasons for delay in the implementation of local border traffic on Belarus' side. In his words, Poland's support for EU sanctions towards Belarus appeared to be the primary cause of Minsk's reaction. 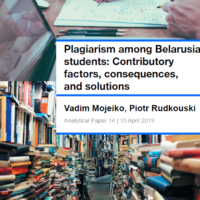 On the other occasion, the Belarusian consul in Bialystok said that in addition to the political motives, technical difficulties related to the lack of special printing devices were also hindering implementation of the procedure. As data from the Polish Ministry of Foreign Affairs shows, around 1.1 million Belarusians from the Hrodna and Brest regions might receive permission for non-visa movement. On the Polish side, implementation of such an agreement can benefit around 600,000 Poles. Looking at these figures only, Belarus would gain significantly more from implementing the agreement. In addition, as the table below demonstrates, the overwhelming majority of those who cross the Belarus-Poland border do not have Polish passports. In other words, Belarusian citizens would benefit from simplification of cross-border movement much more than Poles. Table 1. Crossing of the Belarus-Poland border in the fourth quarter of 2012. Poland's Central Statistical Office reports that over two million Belarusians came to Poland last year. According to estimates of Poland's Customs Chamber, the majority of the foreigners who purchased consumer goods in Poland were Belarusians. Foreigners in the Belarus-Poland borderland claimed over 750,000 tax-free documents. A majority of them crossed the border in the Podlaskie region of Poland. Both Belarusians and Poles cross the border mainly for shopping (82.5% of Poles and 73% of Belarusians). Consumer electronics, food, chemicals and fuel are the goods in highest demand. As has been true for many years, trade and business allow many in the borderlands to survive. Poland's institutions and businesses are clearly interested in seeing more Belarusian visitors. The Opera House in Bialystok sells tickets for musical performances to Belarusians in a package deal that includes a visa, accommodation in a hotel and a city tour. The price is cheaper than the cost of a tourist visa itself. According to the opera's director, Robert Skolimowski, 13,000 Belarusians have already booked tickets for this year's performances. The cultural element is important here as well ,and can truly bring both nations closer together, but it serves another function too — it contributes to Bialystok's budget. Bialystok's local newspaper Gazeta Wspolczesna notes that 'almost 2 million people on both sides of the border are waiting for it to go through'. Another Polish outlet, Kurier Poranny, reports on Sokolka, a town near the border, for which local border traffic appears to be crucial for more dynamic economic development of local businesses. The queues in the Polish consulates in Belarus prove that many Belarusians have an interest in coming to Poland and going further West. Last year three Polish consulates issued 350,000 visas to Belarusians. Poland is overwhelmed with visa applications and Latvia has offered its support with issuing visas to Poland. Beginning on 18 March 2013, Belarusian citizens may also apply for Schengen visas to Poland at Latvian consulates in Belarus. Certainly, the absence of easier means of crossing the Belarus – Poland border efficiently hinders the development of these border regions. But for now the population of the border regions in Poland and in Belarus remain hostages of high-level politics. On 13 March, Belarus hosted a high level guest – Serbian president Tomislav Nikolić. Nikolić and Serbian businessman Dragomir Karić symbolically launched a new construction project near national library. Today Serbian company Astra Investment is one of the largest investors in Belarus development sector. Development remains one of the few industries foreigners eagerly invest in Belarus because of high and quick profit. Meanwhile, Belarus authorities struggle with other problems of urban development. They fail to properly regenerate the Old Town of Minsk and their policy of compaction of districts in already densely populated city causes protests of locals. Although Belarus experiences economic stagnation and resists market reforms, the intensity of development and construction makes an impression of a thriving area. Indeed, development presents one of the few sectors that foreign companies readily invest in Belarus. In this most cases foreign does not mean western, as investors come from Arab countries, Russia, Iran, Turkey and China. Serbian Astra Investment serves perhaps the biggest investor at the moment. Its projects, Majak Minska (Lighthouse of Minsk) includes a shopping and entertainment complex and several housing projects. Construction especially flourished after 2009, when the International Ice Hockey Federation chose Minsk the venue for the 2014 championship. The event seems especially important for regime’s image and international legitimation, therefore authorities do their best to prepare the capital for the upcoming championship. The amount of work is substantial – Minsk definitely lacks tourist infrastructure. However, as it usually happens in Belarus, people do not know how the deals are made. This behind-the-scene politics causes discontent of the public. This discontent is fairly justified – very often good pieces of Belarusian land go to president’s friends without asking people’s opinion. For example, in 2012 an official document with a mark “confidential” appeared in Belarusian Internet. According to it, Aliaksandr Lukashenka ordered to grant Qatar state (in fact its ruling family), lands near Minsk for building residence and open-air hunting cages. Expensive lands near the capital should be granted for free for 99 years. Such generous presents of course are a part of bigger deals that the authoritarian leader makes with his Arab counterparts. Regeneration of old building remains a disaster in Belarus. Denationalised Belarusian bureaucracy does not realise the value of architectural heritage and do not want to stick to legislation on urban development during the restoration of old buildings. Most famous cases from recent decade include reconstruction of Old Town in Hrodna, a town with old European architecture in Western Belarus. Authorities conducted reconstruction with numerous violations. They did not conduct archaeological excavations and damaged a layer of remnants of the mediaeval city; changed traditional planning of Old Town; destroyed some buildings and built them from modern materials instead of restoration. As a result, the biggest Old Town in Belarus turned into typical town of Lukashenka period. Minsk is in a similar situation now. Poor reconstruction of Old Town of Minsk started in USSR already. Today, in independent Belarus the authorities continue to destroy the historical face of the city for reasons of quickness and minimization of cost. The 2014 ice hockey world championship makes the authorities hurry in their preparations. Among the biggest problem of renovation experts name the destruction of former planning of the streets and buildings. While a single wrongly erected building can be destroyed and restored, the rebuilding of the whole planning seems hardly possible and will be extremely costly in future. Another task during regeneration is to preserve the past cultural landscape, but Belarusian authorities prefer to turn Minsk Old Town into a business-centre. According to historian Zachar Šybeka, one of the best experts on Minsk history, normally the Old Town becomes conservation zone, where new construction is prohibited. In Belarus, he says, such norms do not exist in law. As a result, modern buildings appear in the centre. They overshadow the historical architecture and make the whole view ridiculous. Sadly, authorities even abuse religious monuments like church complexes. Instead of giving them back to church, officials use buildings for state purposes. In one case, they even presented a plan to turn a former monastery building into hotel with casinos. Rapid growth of construction results in the lack of free space in the city. Notably, Lukashenka prohibited the spread of the city and building on agricultural lands. Authorities offered an alternative solution – to boost “satellite towns” that lay near Minsk. Citizens that need housing can build it in those towns now. However, new elite housing and business and shopping centres mushroom in the city, and somehow authorities manage to find land for them. Clearly, those projects are highly profitable and Minsk authorities do not miss a chance to earn some more cash and report to the top about their success. The government promotes policy of compaction of some communities to create new places for profitable projects. This policy sparked social tension and protests of city dwellers. Politically indifferent Belarusian may become very active and aggressive when the deal concerns their property. Take for example the case of Uručča conflict. In spring 2012 dwellers of Uručča district protested against building of several houses, some of them were assigned for riot police families. This fact stirred up the discontent with authorities because Belarusians perceive police as a part of the regime. Still, dwellers had no chance to win in this case. Similarly, owners of the housing in the central district resist the plans of authorities to evict them or rebuild the part of houses and implement other projects. Such sporadic protests appear here and there and authorities have to compromise. They organise civil discussions, where experts, architects, officials and citizens discuss the construction plans. So far, the discussions appeared not quite fruitful, as sides do not want to listen to each other and retain their positions. Nevertheless, authorities accept that such protests indeed prevented some projects or changed them. “Prevention of social tension”, the term that authorities use, shows that even in today's Belarus people can effectively defend their interests if they organise.